Guided double-decker bus tours are always popular in leading cities around the world and Brussels is by no means an exception to this. 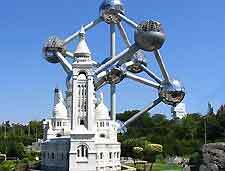 This sightseeing tour lasts around three hours and passes many of the best tourists attractions along the way, such as the Atomium structure and the cathedral, making 15 stops and operated by the Brussels City Tours group. Travellers are permitted to depart to explore the area, later reboarding another one of these regular buses. Headphones provide multi-language commentary and tickets remain valid for a total of 24 hours. 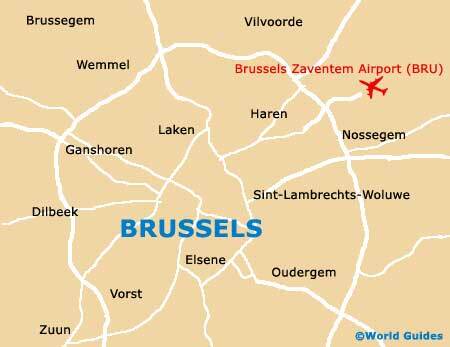 The Brussels City Tour buses also take in other leading tourist attractions such as the Palace of Laken, Louise Square, Royal Square and the Triumphal Arch close to Jubelpark. 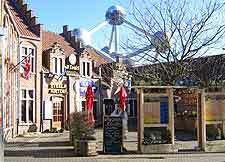 One of the leading family attractions in the city, Bruparck Brussels is a vast theme park with endless attractions and exciting structures to explore. An expanded version of Merry Belgium (Vrolijk België), part of the city's World Exhibition of 1958, Bruparck contains a huge playground area, the Oceadium (Océade) water fun park, the enormous Kinepolis cinema and many appealing eateries, which often boast outdoor terraces and excellent views. 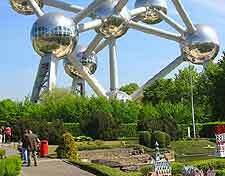 Also part of Bruparck is the Atomium and Mini Europe, both of which are explained in further detail below. Mini Europe is a true wonderland for all of the family, allowing you to enjoy many of Europe's most famous buildings and attractions, all of which stand alongside each other, within the city's Heysel area and are part of the Bruparck complex. Bring your camera and expect to find endless favourites, such as London's Palace of Westminster, the Paris Eiffel Tower, and the Brussels City Hall itself. Many of these highly detailed model buildings cost literally thousands of euros, take months to create, and are constructed in more than 55 workshops. The evening fireworks displays at Mini Europe is always extremely popular. This rather futuristic attraction is located along the Boulevard du Centenaire and is a leftover from the World Exhibition, staged some 50 years ago. 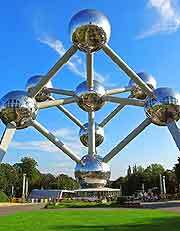 The Atomium is a scale model of an actual iron molecule and features a fast lift to the top, through the very centre of the ball, where visitors can enjoy breathtaking views across Bruparck from its observation platform and restaurant, some 100 metres / 328 feet above the ground. A modern sports centre with more than 80 different playing fields providing endless facilities, the Centre Sportif de la Woluwe is perfect for those who enjoy all aspects of sport. Basketball, tennis and badminton courts are also available, along with a well-equipped gymnasium and regular fitness classes. Guided tours of the famous Brouwerij Belle Vue brewery are always enjoyable, although the opportunity to sample some true Belgian beers at their very best is the reason that so many people choose to visit this attraction. 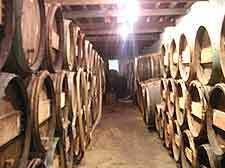 Lasting approximately one and a half hours, the guided tours take visitors on a journey through the production process, starting with a short film before leading onto the fermentation and barrel making areas, before finally reaching its very own traditional tavern. 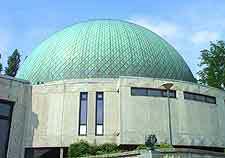 Astronomers everywhere will enjoy a visit to the Brussels Planetarium and its many stargazing wonders. With sky shows explaining the star constellations and solar system, projected directly onto the ceiling of the Planetarium itself, other attractions include various exhibitions and hands-on displays, allowing you to gain more of an appreciation for the sky at night. Located in the Anderlecht area of Greater Brussels, on the Drève Olympique, the Yeti Ski and Snowboard offer to perfect place to hone your skiing skill before you actually venture into the mountains and the real seasonal ski resorts. This popular ski school lies on the city's westerly outskirts and features an artificial piste and ski run, along with two ski lifts and equipment rental.